Ahhh, the constant quest for creative enlightenment has turned up another gem in recent weeks. 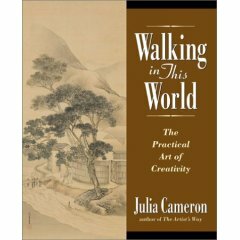 While searching through bookstores throughout Tasmania, I came across a book with the somewhat daggy title, 'Walking in this World', written by Julia Cameron (the author of well-known book, 'The Artist's Way'). On my return to Brisbane I tracked it down at the local library, and have started reading through the first couple of chapters. Its first revelation was a trifecta of creativity prompters:- a) morning writings, b) random walks, and c) artist play dates. Walks and play dates are things I already do somewhat regularly anyway, but morning writings have proven to be most beneficial. The concept being that you write in a journal for 30 minutes every morning, just writing down whatever tumbles out of your head, kind of stream-of-consciousness style, with no particular structure or audience. In fact, you're not even supposed to read back over what you write until you've finished, and no editing or censoring, just tumbled-out thinking. So now I have added morning writings to my up-early morning schedule, and so far it has done wonders for clarifying my daily thinking. Assorted issues lingering in the back of my mind have already found their way onto the pages. In a sense, getting this random mind-junk down on paper has alerted me to issues that I wasn't even aware of before I started scribbling them down, and funny thing is, as I continue the writing, the solutions become apparent. It's quite the cathartic experience. Several months ago I asked a number of friends + family to tell me their top 3 fiction recommendations, and from the overwhelming response, I have compiled the list of books you see in Shelbyville's left-hand column. At the time, I figured that if one of my goals for the year was to read more fiction, then what better way to select a reading list than to ask my nearest and dearest what their favourite books were? After all, it would come with the added bonus of a little insight into their personalities! It was interesting to discover who fell in to the category of avid fiction reader (i.e. my brother who could give me no less than 6 favourites!) and those who were just plain anti-fiction for reasons ranging from the understandable 'not-enough-time-for-fiction' to the crazy 'have-never-read-a-book-in-my-life' (and having always been a huge reader myself, I can barely fathom this notion...). What a variety of genres I ended up with! I was suggested everything from hard-core sci-fi to children's books, from the light-hearted to the ultra-serious, from modern-day novels to vintage fiction classics, masculine, feminine and everything in between. Thanks to all those who gave me their suggestions + those who have personally lent me their books. I suggest that once I read them, we then get together and critique them over a drink or two... Red wine, of course. Inspiration struck the other night. I was looking through some of the treasures I brought back from the Tasmania adventure, and while I was lovingly toying with a couple of vintage sewing patterns I bought in random antique stores around Tasmania, I had an idea for the books I am making for a 'bookswap' I'm part of (bookswap = small group of people who handcraft books based on a theme, and for however many books you opt to make, you will get that number of books back from the other members of the bookswap). The theme for this current bookswap is 'patterns', and my idea was to base my books on sewing patterns rather than the obvious interpretation for 'patterns'. 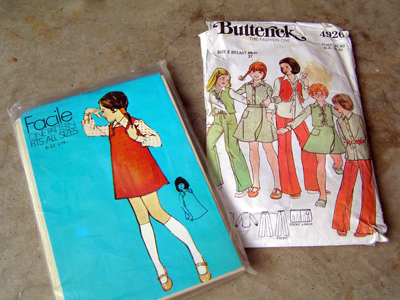 Next thing I know, I'm digging out a stack of old sewing pattern trace-paper stashed in the bottom of one of my craft drawers (I can't even remember where I got it all from, it's been there that long. 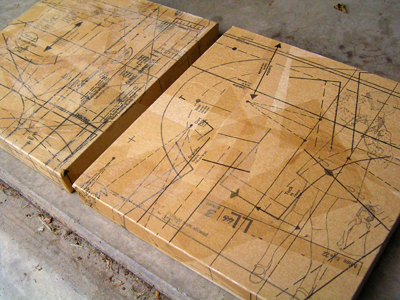 Thank God for craft drawers...), and I begin to play with the pieces of trace-paper, holding them up to the canvas this way and that, until finally I take the plunge and start collaging pieces directly onto the canvas. 2 hours later, I sit back and admire my efforts - an interesting layered effect that will work as a nice little base for my next oil painting (did I mention that this was happening between the hours of 3am and 5am..? Creativity has no normal schedule). So last night I created a second canvas using the same technique, since I want them to be a matching set. 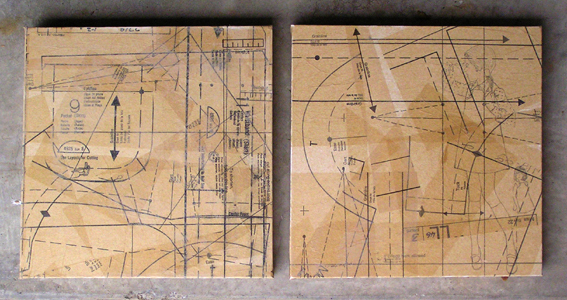 I'm not sure whether that means I get to count these as 2 canvases towards my yearly goal of 12. I think that since I'm so far behind schedule already that it's probably a good idea to count these as #2 and #3 canvases!! I know, I know, I haven't even finished VW3 yet, and you're all waiting to see the next stage of its development, but that's the nature of Michelle's projects - they NEVER run on simple, straightforward, linear timelines! Rest assured however that I will be continuing with VW3 again very soon. I just had to act on this inspiration when it struck!